Remember I told you about the storm? It’s raging in full force and better still, it is not expected to abate for some time now. The storm that is the beginning of the school year. It feels like we are running a marathon relay race chasing one activity after the other, one deadline after the other, with no finish line in sight. Such is this phase of life! Like Indra Nooyi said your family, your job, and your commitments, want you at once. They are a package. And I say, grab them when you have a chance because the offer comes with an expiration date. On that reflective note, here I am reflecting further on the little moments of this week. Having woken up bright and early at 3:30 A.M. for an early morning flight, I sat by the window, mourning the loss of beauty sleep until I opened the shutter on a whim. Lo behold, what a breathtaking view! As the plane weaved in and out of the cotton like white fluffy clouds, the moon was receding into the background as the sun worked its charm, painting the sky in hues of blue and pink. If this was not enough to make my day, a nice rainbow danced merrily by one of the wings taking me to the edge of my seat. Dawn/dusk has to be the most magical part of the day and sunrise/sunset the crown jewel of nature’s beauty! It’s a silly incident but it made me realize what a disservice we do to ourselves when we anguish on what could have been instead of soaking in the beauty of what is. Kindness from strangers touched my life this week. Reinforced my belief that a compassionate word, a helping hand, and a pat on the shoulder are some of the finest gifts you can give and receive. Indian Sunday school started last Sunday. I can’t wait to get to know the children in my class and be part of their learning experience. It was nice exchanging life’s happenings with other teachers, pulling the librarian uncle’s legs, and hi-fiving the high school volunteers. I really do experience a bit of India every Sunday when I am with this community. TGIF. The weekend could not have come soon enough although we all know it will pass in the blink of an eye with more scrambling around than during the week. But hey, it’s the weekend! The angst followed by relief. That’s the cycle I go through every time there is a business trip. And the story never gets old, thank god for that. Some separation, not a lot just a little bit, every once in a while is not a bad thing after all. It shakes me off my complacency towards Da, makes me hug my children tighter, and spend time intentionally with them. My gratitude quotient goes up a notch higher, albeit briefly, following a trip. Attended b’day parties. Simple gathering with close friends. A much needed pause to the running around. Hurray to that. Chalo, take care you all…! We are already in the middle of Sept. Can you believe that? The sight of long braided hair swinging back and forth keeping up with the stride of its owner has always made a dent in my heart. There is a certain charm or a lakshnam that radiates from someone with thick jet black hair, wouldn’t you agree? My hair was at its healthiest in the postpartum period following Hari’s delivery. The prenatal vitamins and the nutritious meals did the trick. No such luck the second time around though. For the past few years, let’s just say that it has been one swift downhill with more hair swirling on the floor of my house than what was residing on my head, and don’t even get me started on the accelerated pace of graying..! Well, what more can one expect from gross negligence, isn’t it? In spite of having lost its glory, I struggled with letting go. Clinging to the vain hope that it will somehow turnaround with absolutely no care taking on my part. But hey, there is only so much running away from one’s inner truth. At some point, one succumbs to its glare! One fine day, it dawned on me that I need something bigger, something more compelling, to let go of the somewhat long, but hardly dense hair. And from that need came the desire to grow my hair so I can give it away to someone who can put it to better use. What better motivation than knowing that you can make a difference, right? So I have been growing my hair with the goal to give it away. And this weekend. I took the plunge. I chopped eight inches of my hair and bagged it to ship it away to an organization that will take it. I did some research and intend to go with Pantene Beautiful Hair Length. Going forward, I feel motivated to take good care of my hair, nurture it, so the quantity will be backed with quality and will be worthy of use. On a side note, I couldn’t help but observe a palpable difference in my attitude from a decade back. In my mid-20s, I resisted cutting my hair because there was a part of me that did not want to erase my identity as a girl with long hair. Listening to someone say, “see she may have gone to the US, but she still has not changed as a person. She still has long hair” would have been music to my ears. But today, past my mid-30s, I laugh at the silliness of my 25 year old self. This weekend , it was about overcoming my inertia. About keeping an open mind, allowing myself to evolve , and being true to myself. I was on the verge of giving excuses and skipping our tradition of making Ganesha out of our hands this year, but Hari dived right into it and that galvanized me into action. 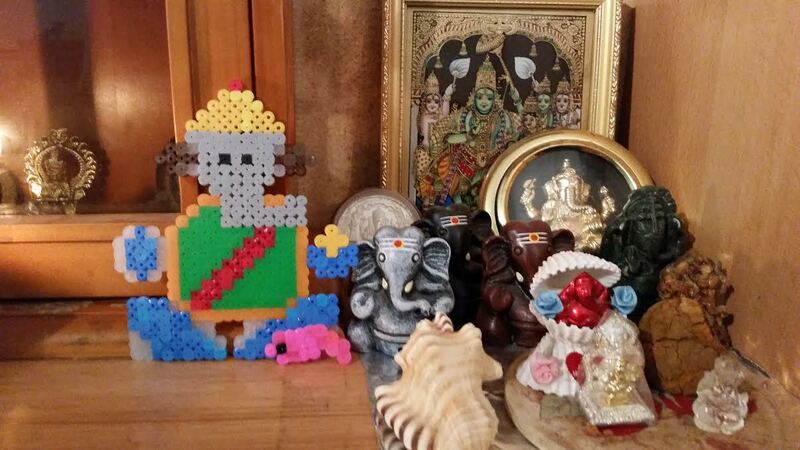 We celebrated Ganapathi this year by making Ganesha out of fuse beads, and devouring the kozhukattais that our friends so magnanimously shared with us.